Flat Panel Tv Wall Unit In A Dark Oak Finish, Can Also Be Used For DLP Tevelelevision Sets. Includes Drawers And Storage Space. Size: 65In L x 19In W x 65In H. Strong Construction. Easy To Assemble. Entertainment Center In Black. Features TV Shelf, CD Rack, Bottom Shelves For VCR Or DVD, And Rack For Video Tapes. Easy To Assemble. Size: 33 x 18 x 60H..
Beech Finish Entertainment Center With Wine Holder And Revolving CD Case. Accommodates Up To A 36In TV. Easy To Assemble. Strong Construction. Size: 68In W x 20In D x 72In H.
Entertainment Center In Black. 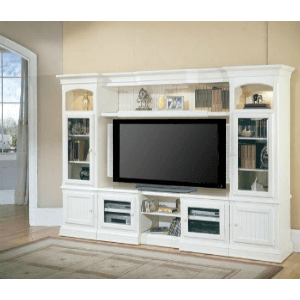 Features Shelves For TV, VCR, DVD, And Other Entertainment Accessories. It Also Has CD, And Video Tapes Racks. Easy To Assrmble. Size: 49 x 19 x 66H.. Maple Finish Entertainment Center With CD Storage Rack And Glass Door. Accomodates Up To A 31 In. T.V. Easy To Assemble.Dimensions: 47 In.(L). X 19-1/2 In.(D). X 70-1/2 In.(H). With Room For 52 In. Plasma TV And Storage Drawers, This Group Is Perfect For Any Home Theater Setting. Finished In A Rich Cappuccino And Silver Drawe Pulls. Details:Media Stand: 58 In.L. x 22 In.W. x 21-1/2 In.H..Audio Tower: 21 In.L. x 17-1/2 In.W. x 47-1/2 In.H. Gun Metal Finish TV Stand With Glass Shelves. Size: 46In L x 20In D x 25 1/2In H. Also Available (Not Included In The Price) To Complete Entertainment Center Two Tower With Bridge 700123 (CO), Size: 37In L x 20In D x 60In H. Strong Construction. *Local Delivery Or Store Pick Up Only. Click Here For Delivery Areas. Natural/Silver Gray Luxurious TV Stand. Size, 48x30x31.5H. Easy to assemble. Acme 6611. Black T.V. Stand With Casters And Shelf. Accomodates Up To 25 T.V.. Easy To Assemble. Dimensions: 25L. X 18W. X 16H..
Metal And Glass In A Dark Gray Textured Finish, With CD Holders On Sides. TV Stand Size: 43In L x 23In W x 22 3/8In H. Also Available (Not Included In The Price) To Complete The Entertainment Center Side Tower, Size: 27 1/8In L x 22In W x 46 1/2In H. *Local Delivery Or Store Pick Up Only. Click Here For Delivery Areas. Oak Finish T.V. Stand With Casters And Shelf. Accomodates Up To A 25 T.V.. Dimensions: 25L. X 18W. X 16H..
TV Stand In All Glass With Slide-Out Tray. Lockable Casters. Easy To Assemble. Size: 34 In. (W) x 20 In x 21.5 In. (H). Entertainment Center. Size, 98x22x75H. Fits 40 to 60 TV. Easy to assemble. Oak Finish. TV Cart Optional, (7331) Size, 40x26x24H. Acme 7330. Combination CD/T.V. Cart With Storage. Accomodates Up To 28 T.V.. Easy To Assemble: Dimensions: 31-1/2L. X 15-3/4W. X 24-1/2H..
TV Stand With Wooden Shelves And Lockable Casters. Strong Construction. Easy To Assemble. Size: 34 In. (W) x 20 In. x 21.5 In. (H). Black Finish Entertainment Center with Metal And Glass. Details: TV Stand Size: 42 1/4In L x 20In W x 24In H And Side Tower Size: 25In L x 20In W x 47 1/4In H. Sold As A Set Or Sold Separately. Easy To Assemble. *Local Delivery Or Store Pick Up Only. Click Here For Delivery Areas. Black T.V. Stand With Glass And Casters. Accomodates Up To 31 T.V.. Easy To Assemble. Dimensions: 32L. X 16W. X 18H..
Oak Finish T.V. Stand With Glass And Casters. Accomodates Up To A 31 T.V.. Easy To Assemble. Dimensions: 32"L. X 16"W. X 18"H.
Entertainment Center. Size, 98x22x75H. Fits 40 to 60 TV. Easy to assemble. Cherry Finish. TV Cart Optional, (7333) Size, 40x26x24H. Acme 7332. Black Corner T.V. Stand With Glass And CD Storage. Accomodates Up To A 36 T.V.. Easy To Assemble. Dimensions: 30L. X 39W. X 22H..
Large Scale TV Stand in Dark Gray Finish. 3 Piece Set Includes Stand, Media Tower and Finish Bridge. TV Stand: 60 x 22 x 19 In. (H). Tower: 25 x 21-1/2 x 60 In. (H). Bridge: 80 x 21 x 2 In. (H). Entertainment Center. Size, 118x22x70H. Fits 60 TV. Easy to assemble. Acme 8715. Grey/Silver Finish T.V. Stand With Two Glass Shelves. Easy To Assemble. Dimensions: 37W. X 20D. X 24H..
Chrome Finish T.V. Stand With Frosted Glass Shelves. Easy To Assemble. Dimensions: 45-3/8L. X 21-3/8W. X 55-3/4H.. *Local Delivery Or Store Pick Up Only. Available in White, Cherry, Black, and Silver. 73 In. (W). x 23 In. (D). x 20 In. (H). Black Entertainment Unit. Has Shelves To Accomodate TV, DVD, And VCR. It Also Has Holder For CD«ÉŸs And Video Tapes. Strong Construction. Easy to Assemble. Measures: 71 x 18 x 66 H.
Bali Entertainment Center (PI). Size: 53 1/2 x 17 5/8 x 61 7/8H. Details: Sliding Door Design, Side Panel CD Racks holds 108 CDS and Extra Storage Behind Doors. Strong Construction. Easy Assembly. Gray/Silver Finish T.V. Stand With Wide Legs. Easy To Assemble. Dimensions: 36W. X 20D. X 24H.. 7583 (CO), TV37 (E&S). *Local Delivery Or Store Pick Up Only. Black Entertainment Center With CD Rack. Accomodates A 28 T.V.. Easy to Assemble. Dimensions: 32-1/2L X 18-1/4W. X 66H..
Black Metal Corner Entertainment Stand. Accomodates Up To A 32 T.V.. Easy To Assemble. Dimensions: 45-1/2L. X 30-3/4W. X 68-1/2H..
Entertainment Center. Has Holders For CDs, VCR, DVD, And Magazines. Easy To Assemble. Strong Construction. The frame is black metal. Dimensions: 32.5 In. X 18.5 In. X 66 In.(H). Cherry Finish T.V. Stand With Storage. Accomodates Up To A 29 T.V.. Easy To Assemble. Dimensions: 37-1/4L. X 15-1/2W. X 21H.. Dark Oak T.V. Rack. Accomodates Up To A 29 T.V.. Easy To Assemble. Dimensions: 36-1/2L. X 19-3/4W. X 60H..
A Sleek And Elegant Maple Finish TV Stand, Beautifully Crafted To Fit Into Your Living Room. Features Adjustable Shelf For Components, Two Front Side Rack For CD Storage And Also Two Side Rack For DVD And Video Cassettes. It Can Accommodate Up To A 36 In. TV.Dimension: L. 35.5 In. x W. 23.75 In x H. 22 In.